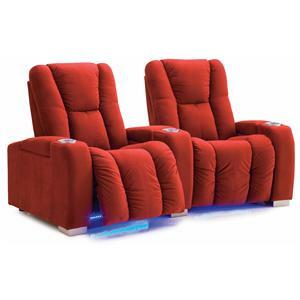 This plush sectional is sure to turn your home theater area into a luxurious and comfortable haven, helping you relax and get in the mood for drama, comedy and action. 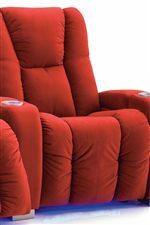 Two people can sit side-by-side in these comfortably cushioned seats, specially padded with resilient, high density foam and the stable support of sinuous coil springs. 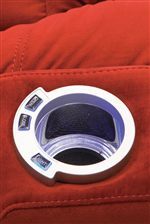 Available with an abundance of nifty high-tech features, choose cupholders with LED lighting, LED groundlights, tray tables for your computer or tablet, or the intense sound of a Buttkicker audio transducer. 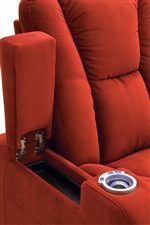 Customize the look of your sectional in a wide variety of fabrics and supple leathers, and accent your upholstery with wood or aluminum feet and a choice of stainless steel or antique-finished cupholders. 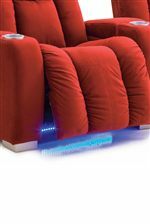 The Media Contemporary Manual Reclining 2-Seater Home Theater Sectional at Rotmans in the Worcester, Boston, MA, Providence, RI, and New England area. Product availability may vary. Contact us for the most current availability on this product. 46402-3R RHF Arm, Manual Recliner 1 33" 41" 43"
46402-5R LHF Arm, RHF Wedge, Manual Recliner 1 48" 41" 43"
Browse other items in the Media collection from Rotmans in the Worcester, Boston, MA, Providence, RI, and New England area.